Autumn does not trust Santa! 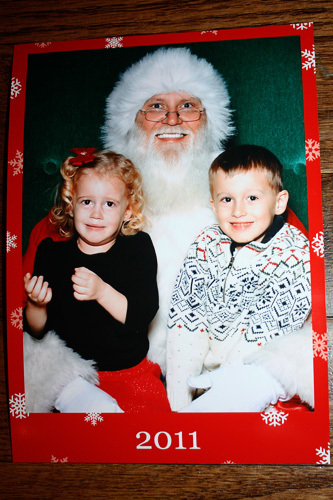 The lady at the mall said she has been taking Santa photos for 7 years, and she was an expert at getting a photo right before they started to cry. She was right! I set Autumn in Santas lap, Autumn’s arms are still up from me setting her down, and she is JUST starting to cry! Haha! And, oh, did she cry! Poor thing! But, so worth it for Momma to have another Santa picture for her collection. ;o)- Nathan did really good! He chatted with Santa about what he wanted for Christmas for a LONG time. That boy has QUITE a long list!